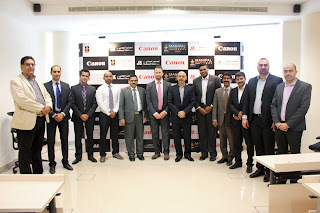 The School of Media & Communication in partnership with Canon Middle-East, and National Stores, signed a Memorandum of Understanding (MoU) to facilitate the existence of a Canon Photo Lab at Manipal University Dubai on 28th October 2015. The aim of this initiative is to enhance students’ photography skills and equip them with technical knowledge that would help bring them at par with the industry. Great emphasis was also placed on empowering students to expand their educational horizon and employ pre-requisite knowledge for the betterment of society as well as themselves. Dr. R.N Shukul, Chairperson of the School of Media & Communication, warmly welcomed Mr. Hendrik Verbrugghe, Marketing Director at Canon Middle-East and Mr. Ateeq A. Shamsi, Director of Sales & Marketing, National Stores who further addressed the gathering. “We care a lot about sustainability and in this region we want to promote that. For example, what we do in Africa is to make sure that people are educated about photography so that they can make a living out of that knowledge. For this purpose the collaboration we are having now with this university is with the same idea - so that we can provide equipment, knowledge and organize workshops,” said Mr. Hendrik Verbrugghe. The event was concluded with the signing of the MoU, which marked the beginning of the future Canon Photo Lab at Manipal University Dubai.